In the ancient western world attempts were made to organise everything into some form of understandable order, angels were no exception. Back in the sixth century Dionysius the Areopagite wrote his 'Celestial Hierarchy' and this was later adopted by the Catholic Church and has remained the main stay of thinking on angel hierarchy ever since, with only minor variations such as those proposed by Dante. Most contemporary writers on angels accept Dionysius' hierarchy almost exclusively. There are different hierarchies in the traditions of Judaism and Islam, where much information on angels is readily available. Here we will concentrate on the hierarchy proposed by Dionysius. Surround the throne of God, constantly singing his praises. The Seraphim are the highest choir of angels and surround the throne of God. They are mighty angels of love and light and are believed to contain so much love that they appear as flames and as such have been described as 'fiery spirits' or 'burning ones'. 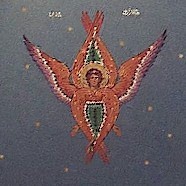 They are mentioned in the Old Testament by Isaiah as each having six wings and flames. They constantly sing the praises of God, singing Kadosh, Kadosh, Kadosh - Holy, Holy Holy and as the do so, they maintain the vibration of the original blueprint of creation. It is from their ranks that the fallen angel Lucifer came originally. Guardians of the stars and heavens, and bestow knowledge. The word cherubim comes from the Akkadian language and means 'one who prays'. Often Cherubim are placed by God at the entrances to palaces and temples as threshold guardians and spirits of protection. They are mentioned in the bible as being placed by God at the gates of Eden to prevent Adam and Eve from returning to the garden. They are also the guardians of the fixed stars and keepers of heavenly records and bestow knowledge and known as the record keepers who express their love of knowledge and wisdom by helping to carry out the will of God. They correspond to the order of Ophanum or the order of Haoth in the Talmud (Judaism). Angels of justice who carry out God's decisions. Third in the hierarchy. They are known as 'the many eyed ones' Often described as 'fiery wheels' based on an account by the prophet Ezekiel around 580 BC and accounts by Elyah and Enoch. They a mighty angels of justice and it is their task to carry out the decisions made by God. They receive direct illumination from Source and are transformers of Divine wisdom into a level humanity can accept. Have Divine Power over all creation. These mighty angels have power over all of creation and manage the daily function of the Universe. They regulate and supervise the angels beneath them (those above in the hierarchy are so much closer to God that they do not need supervision.) The mercy of God manifests through them and so they are known as channels of mercy. In Judaism they had 'dominion' over certain countries. These are know as 'brilliant' or 'shining' ones and are often associated with acts of miracles or heroism. They provide encouragement and blessings to those in time of need. Often giving strength to over come a situation rather than preventing the situation completely. They are believed to have helped David against Goliath and Abraham when asked by God to sacrifice his son Isaac. Their main duty is to perform miracles on Earth. They support the physical laws of the planet, but are allowed to intervene if needed. Keep the universe in balance. Protecting us from harm. The Powers are believed to be the first order of angels that were created by God. They protect the world from being taken over by demons. They protect our souls from evil as ministers of God, who avenge evil in the world. The powers include the mighty Lords of Karma and the angels of birth and death. The Lords of Karma keep the collective history of the planet and guard the consciousness of humanity. They also maintain the Akashic records of individuals. Protectors of religions, cities, sacred sites and important projects. These are the seventh choir of angels and first in the third order. They provide strength to tribes and religions to help them pursue and endure their faith. They are also believed to be guardians over nations, cities, sacred sites, important projects, even within smaller communities or example a local school may have its own principality. The can be called upon to help such a project or site or can asked what you can do to help. Chief angels, have important tasks and convey God's messages to humans. 'Arch' means principle or pre-eminent. The archangels are therefore chief angels. Traditionally, depending upon the religion, followed there are considered to be 4, 6, 7 or 9 Archangels. Most religions include Michael, Gabriel, and Raphael. Others often refer to Uriel, Raguel, Zadkiel, Chamuel, Jophiel, Metatron and Sandalphon and many others. It is believed that there are millions of archangels throughout the universe and many more are now coming to the Earth to help us. Each archangel is assigned a specific task by God, for example Archangel Michael is in charge of protection and strength, Raphael - healing, Gabriel - communication and clarity. They have many angels working with them and can be in more than one place at a time. Archangel Michael is considered to be the senior archangel presently helping the Earth. Closest to humankind, include our Guardian angels. The term 'angel' often refers to all the spirits covered by the hierarchy, but Dionysius reserves the term specifically for the lowest choir and those nearest to human kind. Their function is to bear messages from God and to act as intermediaries between God and human kind. In western religions angels are considered as good beings. It is from their ranks that our guardian angel comes. Each of us having a guardian angel assigned to us, who stays with us throughout all our life times. They watch over us and protect us. They are not permitted to interfere with the free will of humans and therefore can only help if we ask them to.